Regulation in Britain: Compare and contrast regulation of Citizens and of Companies. Company executives pay piffling fines, ordinary citizens do jail time. OFGEM has the power to fine upto 10% of revenue. E.ON’s UK revenue in 2013 was £9.9 billion. The £12million fine, about 0.1% of revenue, is not even a drop in that ocean of cash. Money is the one thing that is not in short supply for Energy companies. They are awash with it. Fraudulent behaviour by our Energy and Financial sectors have been ‘punished’ by taking from them that which they have most of: money taken from their customers. Like fining Billy Bunter a doughnut – he may not like it, but he has plenty more. The loss of a doughnut will not reform him. Fraud is directed by people, not companies. Directors don’t fear fines – after all it is almost inevitably the company that pays them. But while they have more than enough money to brush off fines, they have about the same amount of time as anyone else. A year in jail is a year in jail, whoever you are. The Sentencing Council recommends a "benefits fraudster" convicted of taking more than £20,000 should face 18 months to 3 years in prison. And the Crown Prosecution Service (CPS) recommends that if a postman or an ordinary bank clerk pinches £17,500 he goes to jail for 21 months. 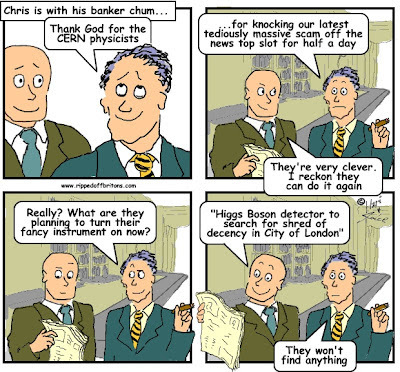 On the other hand the directors of banks pinching billions in PPI fraud just get a bonus. Here's what the CPS says in its "Guideline Breach of Trust Case"
£1 million or more 10 years +"
Is there any doubt that a bit of jail time wouldn’t rapidly and abruptly stop the frauds by our bluest-chip companies? "SSE had put more than 20,000 customers on more expensive tariffs. It gave misleading scripts to its sales agents and most of their monitoring activity was carried out by line managers who received commission on the sales their reportees brought in. SSE’s senior management did not pay enough attention to what its people were doing on the ground. We fined SSE £10.5m." "E.ON committed to pay back around £1.4 million to about 94,000 customers who were wrongly charged exit fees or overcharged after price rises. E.ON also agreed to make an extra goodwill payment of around £300,000 to a consumer fund they run with Age UK." "In May 2012, we confirmed our decision on EDF, which we originally made in March 2012. EDF had acted in breach of its marketing licence conditions. We agreed measures with EDF worth £4.5 million to help vulnerable consumers." "we estimate that the improvement in annual income would be between £6m and £11m, and the lifetime benefit potentially available would be between £115m and £230m for the group of consumers buying annuities from their existing pension providers each year." Should the directors of financial and other essential services companies face jail time when their companies commit fraud? In evidence to Parliament's Treasury Committee on 2nd July 2014 from Alberto Thomas, Partner, Fideres LLP: UK and European fund managers tend not to go to court when they are ripped-off by financial institutions, unlike US fund managers. Seems to be rather incestuous over here! "there is a very big discrepancy between the UK and the US, as you know, from a legal perspective. We have pension funds in the US that have enshrined in their statutes a fiduciary duty—there are pensions here who have lost billions of dollars in these cases potentially, if they are proved right—and they take it upon themselves to act and enforce those rights…we seem to have a reticence in this country, and in Europe in general, in terms of the investment community—institutional investors, pension funds, insurance companies, the financial sector in general—to enforce their fiduciary rights in these types of cases. That is a big obstacle and that is why we see a lot more litigation in this area going on, on the other side of the Atlantic, than we see in Europe."